Does this Opus tile look joyful? Hope so, I'm loving the Renaissance Opus tiles with plenty of room to play with colourful zengems. When I first started drawing gems I wasn't quite sure what to do next.....like, how do I fill in the spaces in between? I decided to make this one a sampler with round gems and a selection of colour. Fun, fun, fun!! I used Prismacolor pencils for the zengems. Excellent work, as usual, Michele. Prismacolor is my go-to brand for colored pencils as well. Gorgeous! It is amazing how you can make these look dimensional and so translucent. Absolutely fabulous, Shelly! I can almost reach out and touch these gorgeous shiny gems. I simply MUST learn how to do this! You do such fine work, Shelly! Love your creative spirit's output. Many thanks for sharing with the tangling world. Yes, This mind blowing beautiful !!! A wonderful composition and such beautiful gems, I adore this tile!!! SO beautiful! Is there any chance you did a stepout? 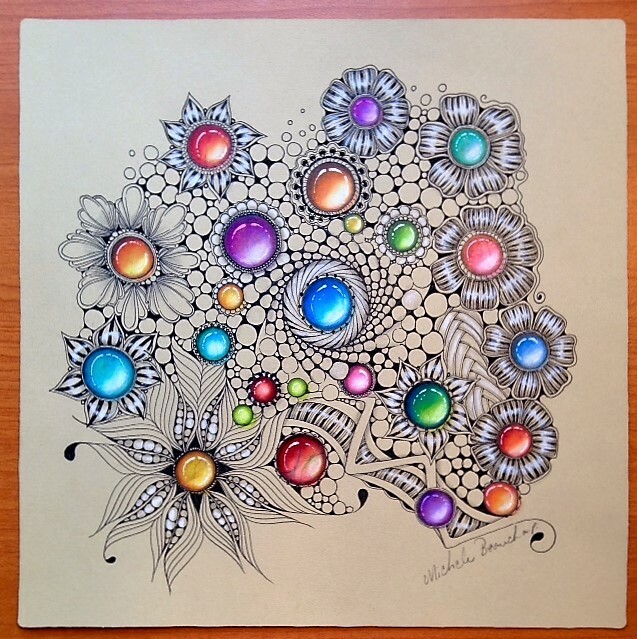 Hi Susan, sorry I don't have step outs but I started by drawing random circles, coloured them in, tangled around the middle one and it grew from there. Hope that helps.